in September 2015, I travelled to Berlin to present the following thoughts on Africa’s future development agenda at the 15th International Economic Forum on Africa, organised by the OECD Development Centre and the German Federal Government in partnership with the African Union Commission. Climate change is one of the gravest threats facing humanity today. It is a global and all-encompassing threat to life, to our water and food supplies, to our health, security, prosperity and stability. To avoid catastrophe, we must dramatically reduce the carbon intensity of our modern energy systems, which have set us on a collision course with our planetary boundaries. No region has done less to contribute to global warming than Africa. Yet Africa is already suffering from some of the earliest and most damaging effects of climate change. If left unchecked, climate change will turn vast areas of productive land in Africa into dust bowls, creating widespread hunger and mass displacement of rural populations. Increased competition over arable land and fresh water is already creating conflict amongst local communities and provoking tensions between states. The consequences of this crisis could be so horrific that the “living would envy the dead” – to quote a late world leader. We have no choice but to join forces in responding to this threat. In fact, climate change represents an unprecedented opportunity for governments, investors, firms and citizens to work together to develop and deploy the low-carbon technologies, which can drive sustainable growth. This is the main message of the new Africa Progress Panel report, “Power, People, Planet: Seizing Africa’s Energy and Climate Opportunities”. It is also the opportunity I will highlight throughout my remarks today. We have no excuse: we must seize this moment to change the way we produce and consume energy, while we still have time. As a global community we have the technology, finance and ingenuity to embark on a low-carbon transition. This transition has already started in several regions, including Africa, which is showing potential to lead the global renewables revolution. Several countries in the region, including Ethiopia, Kenya, and South Africa, are among the world’s pioneers in climate-resilient, low-carbon development. Ethiopia has set an ambition to achieve zero-net emission status by 2027. Germany, as an acknowledged pioneer in this field, is well positioned to work closely with Africa in stepping up the pace of the transition to a global low-carbon economy. The recent pledge by the G7, during the German Presidency, to boost investments in renewable energy in Africa, is a clear and laudable sign of Germany’s intent to partner with the continent in this area. Shifting towards low-carbon energy systems is not only helping to avert climate catastrophe, but also creating new opportunities for investment, growth and employment. From an African perspective, renewable energy technologies have two distinctive advantages: speed and decentralization. They can be deployed far more rapidly than coal-fired power plants, and they can operate both on-grid and off-grid. These advantages are crucial for Africa, because it urgently needs to address its immense energy deficits. In Africa, more than in any other region, a massive and rapid increase in the deployment of solar, wind and geothermal energy technology is essential. The scale of the continent’s energy deficit is sobering. Two out of three Africans – over 600 million people – have no access to electricity at all. Cut off from the grid, the world’s poorest people also pay the world’s highest power prices. A woman in a rural village in northern Nigeria spends 60 to 80 times more per unit of energy than a resident of New York. To meet demand and achieve universal access to electricity, an investment of US$55 billion per year is needed until 2030. Until recently, far too few African leaders have shown sufficient political will to act decisively to bring about the necessary transformation in energy policy. For too long, they have been content to oversee highly centralized energy systems designed to benefit the rich and bypass many of the poor. Power utilities have been centres of corruption. The waste of scarce resources in Africa’s energy systems remains disturbing. African leaders must move more decisively to tackle vested interests and break up webs of political patronage in Africa’s energy utilities. At the same time, they must redirect the billions of dollars currently spent on providing subsidies to wasteful utilities, vehicle fuel and kerosene. These funds should be spent instead on productive energy investment, social protection and targeted electricity connectivity for the poor. Africa is not poor. Africa is a continent with a great wealth of resources. Over the past ten years, the region has built up a solid economic growth track record. However, Africa’s share of global poverty, malnutrition and child mortality is also rising very fast. A key driver for these trends has been the consistent failure to address overall inequality and the specific manner in which the fruits of the new growth are shared. In far too many countries, growth has not been equitable and has failed to create enough jobs. Unlocking Africa’s clean energy power, as I have just highlighted, can drive equitable growth and create jobs. But this has to go hand in hand with a scaled-up approach to agricultural transformation. Africa is a potential global agriculture powerhouse. The continent is blessed with 60% of the world’s uncultivated arable land and could grow enough food, not only to meet its own needs, but to export surpluses. Yet hundreds of millions go hungry every day. Despite recent progress, Africa’s farmers, many of whom are smallholders, are under-performing. Grain yields are around one half or one third of the world’s average. As a result of low productivity, chronic underinvestment, and regional protectionism Africa must import too much of its food. Every year, Africa spends around US$35 billion on importing food. The continent’s population is expected to double by 2050, and triple by the end of the century. Producing more to feed this growing population represents a huge market opportunity. To realize Africa’s agricultural potential, African governments need to put in place policies that increase public and private investment in agriculture, inspire innovation, and reduce risk. At the same time, developed countries must remove unfair trade barriers and eliminate harmful agricultural export subsidies. Governments and the private sector can develop partnerships and expand links with smallholders, filling critical gaps along the value chain. 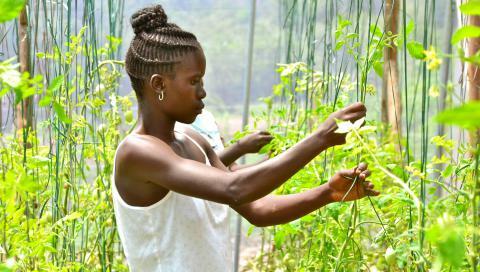 The greatest success will come if bigger farms share market access, improved seed varieties and advanced farming techniques with small farmers. The business community has indeed a crucial role to play – especially when combined with the efforts of other committed stakeholders. It is for this reason that my Foundation recently launched a new initiative, which brings together leaders from the private sector, philanthropy, and global food agencies, to strengthen the productive capacity of Africa’s smallholders. More effort must also be made to improve regional trade in agricultural products. If a farmer cannot sell his produce in the next country, it is much harder to develop a profitable business. Above all, we need a new emphasis on climate-smart agriculture. This is a promising way to enable farmers to adapt to changing weather patterns and growing seasons that threaten food production. Climate-smart solutions – such as the use of drought- and heat-tolerant crops and improved irrigation systems – are critical for food and nutrition security, farming resilience, and higher productivity. Africa’s farmers must be part of the global solution to climate change. It is notable that two of the fastest-growing countries in recent years, Ethiopia and Rwanda, have achieved significant economic growth through agriculture, marking out a path for other African countries to follow. These two countries are also in the forefront of the global low-carbon transition. Ultimately, leaders are accountable to their citizens for the decisions they take. Yet what is possible in Africa will also be determined in part by the actions – or the inaction – of the international community. The Sustainable Development Goals will shift the world onto a resilient path based on the three dimensions of sustainable development: economic, social and environmental. But unless action is taken on climate change, sustainable development will not be achieved. At the UN Climate Change Conference in Paris in December, governments have to conclude a fair, universal and binding climate agreement, by which every country commits to reducing emissions of greenhouse gases. Fairness demands that wealthier countries take the lead. They must provide financial resources and technologies to help poorer countries to cut emissions and adapt to the impact of climate change. Specifically, developed countries must deliver on their commitment to mobilise US$100 billion annually for the Green Climate Fund. Major emitting countries should put in place a credible carbon pricing and taxation system instead of spending billions on fossil-fuel subsidies. The G7’s reaffirmation of its pledge to work for the elimination of inefficient fossil fuel subsidies is thus notable. But we must also support African efforts to strengthen tax and customs administration and reduce illicit financial outflows. In 2012, Africa lost almost US$70 billion from illicit financial flows; resources that could assist Africa move to a sustainable, low-carbon future. But allow me to stress that by its very nature, climate change is a cause that should unite us all. Governments, businesses, faith communities, young people, women, and civil society – we all have to work together to change the narrative on climate change and deliver transformative progress. I confess that this is an ambitious agenda. But there is good reason for optimism. We have the expertise, the technologies and the evidence needed to succeed. However, to succeed I believe that we shall need to move quickly on three fronts. First, we must encourage and assist Africa to shift towards an inclusive, low-carbon energy future. Second, we should recognize and invest in the incredible potential of African agriculture and Africa’s farmers, many of who are women. And finally, we have to secure a global consensus on emissions control at the forthcoming climate conference in Paris without which Africa’s prospects will be greatly diminished. Nelson Mandela once said: “It always seems impossible until it’s done”. He was reflecting on the struggle to overturn apartheid, but his words could not be more timely today. Let us heed Mandela’s words. If we do, I am convinced that Africa can and will achieve a more prosperous and equitable future. Original article: Digital Development Debates, issue n.16, food and farming.